I used to love quesadillas as a quick snack back before I was vegan. Cheddar cheese quesadillas, man were they yummy. 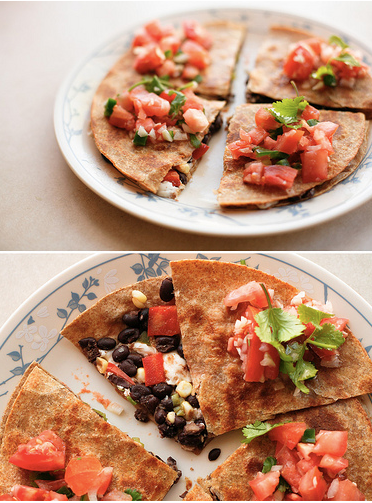 These bean and corn quesadillas blow my old ones out of the water, they make me feel good and are loaded with flavor! Step 1: Heat 1 teaspoon olive oil in a medium sized saute pan over medium heat. Add red peppers, corn, and black beans. Season with cumin, salt and pepper, cook for 3 to 5 minutes. Step 2: Add the lime juice, stir to combine, and remove from heat. To assemble: Lay one tortilla in a hot skillet. Add 1/4 cup filling and then top with 2 tablespoon grated cheese. Top with another tortilla and cook for 2 to 3 minutes, until slightly browned on the bottom tortilla. Flip and cook on the other side until slightly browned and the cheese has melted.